Have a question on GO Plus? GO Plus is available in 5 different colors - Blue, Gold, Gray, Storm White and Ruby. Watch latest video reviews of Datsun GO Plus to know about its interiors, exteriors, performance, mileage and more. Datsun in 2014 gave the MPV segment a more affordable competitor in the form of GO Plus. It started off its innings with the GO hatchback and MPV, however due to tepid response over the years, the Japanese carmaker decided to give the car a major overhaul. Recently, Datsun launched the updated version of GO Plus MPV in the country and just ahead of the festive season. The new MPV gets appreciable changes on the outside and inside along with enhanced safety while the engine remains the same. Datsun GO+ is the most compact alternative to the larger MPVs as the company quotes the car as station wagon or an estate that offers 5+2 seating arrangement. Appearance wise, Datsun GO Plus comes with some extra goodies which makes it pleasing to the eyes. The car looks exactly the same as its hatch counterpart with an extended derriere. Datsun GO Plus gets subtle outer appearance which is liked by many of the Indian buyers as well. GO Plus is the 7-seater MPV but looking at the outer profile, it’s quite hard to tell that it’s a multipurpose vehicle. The changes includes redesigned bumper, vertical LED daytime running strips while the front radiator grille has been tweaked as well. The car gets hawk-eye headlamps, roof antenna, body coloured bumper, door handles and ORVMs. 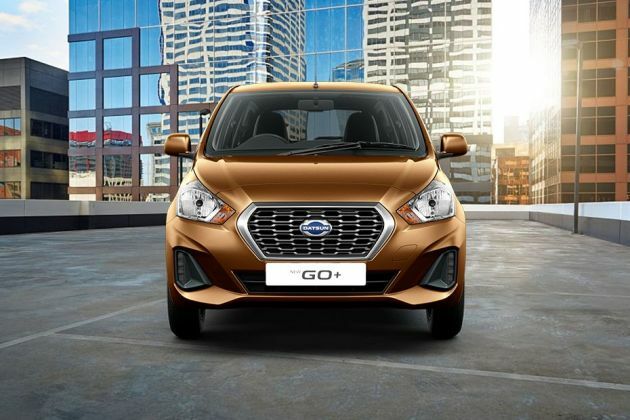 Dimensionally, Datsun GO+ has the length of 3995mm, height of 1507mm, width at at 1636mm while the wheelbase measures 2450mm. From the side, it looks like a wagon and though it’s a 7-seater MPV it doesn’t have a large footprint. The car rides on the 14-inch alloy wheels for the very first time, this gives it a good road presence. Datsun GO Plus MPV is available in five different colour pallets such as new Sunstone Brown, Opal White, Crystal Silver, Bronze Grey and Ruby Red. Interior is the part that receives some of the most prominent changes in the MPV. Leaving the third row, everything seems to be the same as the GO hatch. The quality of the material used is quite satisfactory but not that bad. The car is quite spacious and offers ample amount of head and shoulder room to its occupants, the third row is cramped and good for kids only. The dashboard in the car has been revamped as it now gets updated instrument cluster, conventional handbrake lever and proper glove box. The centre console features 7-inch Blaupunkt touchscreen unit that supports Android Auto and Apple CarPlay. Its additional features are air conditioner with heater, all-four power windows, rear parking sensor, electrically adjustable ORVM and rear window wiper. Datsun has taken the safety aspects seriously this time around. The updated MPV now comes packed with standard safety features such as dual-airbags, ABS with EBD, Brake Assist, keyless entry, 3-point ELR seat belts, child lock, central locking, rear parking assist sensors and follow-me-home headlamps. Datsun GO Plus MPV is available in five different variant they are D, A, A (O), T and T (O). Taking a quick glance on the pricing details, 2018 Datsun GO Plus despite of major update is available in the competitive price range. Its base model GO Plus D is tagged at Rs. 3.83 lakh, GO Plus A is available at the price tag of Rs. 4.53 lakh. The mid-range trim GO Plus A option is offered at Rs. 5.05 lakh. Datsun GO Plus T model is available at the price range of Rs. 5.3 lakh while its top of the line trim Datsun GO Plus T Option is priced at Rs. 5.69 lakh. Though the car does not have any immediate rivals, it has the needed ingredients to create problems for Maruti Ertiga and Mahindra Marazzo. The suspension system in the MPV has been slightly improved following the feedbacks of the consumers. Now it has been tuned a bit to make it more comfortable for Indian road conditions. The upgraded suspension setup which Datsun calls it ‘Ride Control Advanced Suspension’ deals with extra load at the rear quite well. It also helps the car gulps bumps and ruts reasonably well. It does roll a bit while cornering hard which is due to high ground clearance of 180mm, soft springs and lack of anti-roll bars. The steering wheel is light and even though you will feel it responsive, the feedback coming from it will be slightly insufficient. Driving at highway speeds can be disappointing as the car can lose its breath. The sound insulation has been improved and a step ahead of the previous model. The braking system comprising of front disc and rear drum is average and the pedal lacks sharp bite as opposed to the other MPVs. But inclusion of ABS instils confidence in the driver. The Japanese automaker has really upped the ante this time by drastically updating the safety department. The new Datsun GO Plus now comes loaded with standard safety kit which includes dual airbags, ABS with EBD, Brake Assist, rear parking sensors and follow me headlamps. This has really changed the game altogether for the car. What is the price of Datsun GO Plus? On road prices of Datsun GO Plus in New Delhi starts from ₹ 3.83 Lakh for base variant D Petrol, while the top spec variant T Option Petrol costs at ₹ 5.69 Lakh. What are the colors options available in Datsun GO Plus?